There's a super duper event happening here in Copenhagen this weekend. If you live here or are visiting then I highly recommend checking it out. Either as a participant or a spectator. For lovers of the globally popular TV series Borgen you'll especially love it. 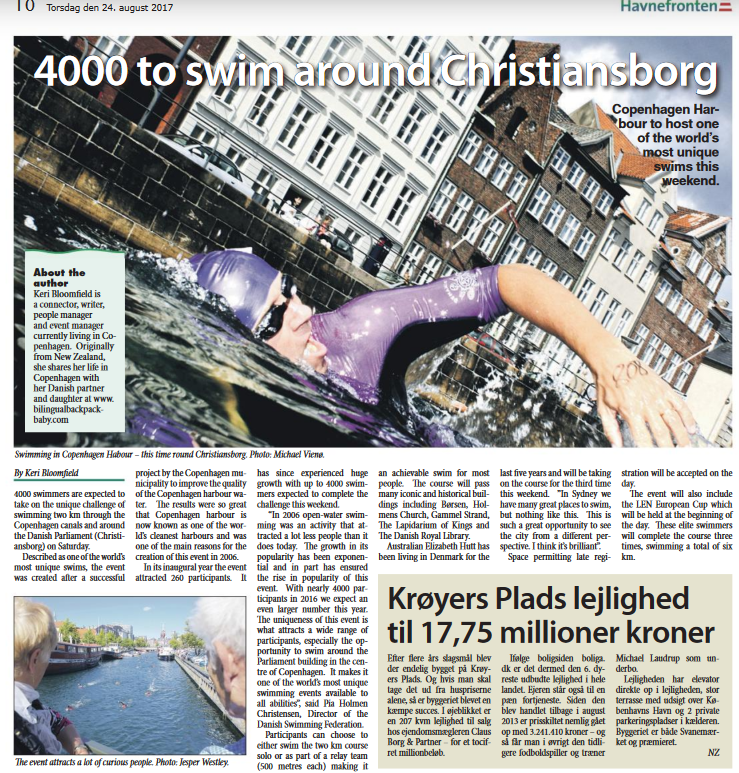 Because this is the one weekend of the year you get to swim around the Danish Parliament. I would have like to have said I'm doing the swim, but I'm not. BBB management and a return to full time work (yep, that's right I got one of those J-O-B things) means it hasn't been a priority or possibility to train this year. However one of my good friends is doing the swim so I'd like to instead take some credits on behalf of her. Har en rigtig god svømning Liz! Before I moved to Denmark I had been told about this event. I thought it sounded great and really unique. So I dropped them an email when I arrived which was the beginning of my support and interest in this event. Last week I wrote an article about the event which has just been published in the Copenhagen newspaper, Havnefronten. You can check it out here https://issuu.com/havnefronten/docs/havnefronten_20170824/10 or simply admire the pretty graphic below. So if you are in Copenhagen this weekend, I highly encourage you to go check it out. Head to the 'Black Diamond' on Saturday which is event HQ and from there you'll easily be able to walk around the course. Of course, if you're actually participating then you'll be best placed to swim the course. BBB & I wish all the swimmers the very best for this weekend!